Most of you know me as a professional singles player. However, what you may not know is that I love to play doubles. No, I’m not talking about doubles on a singles court. I am talking about good old-fashioned North American hardball doubles. I first learned the game when I was growing up on Long Island. While waiting for a singles court, I would sometimes get on the doubles court at the Creek Club. I loved it and I have been hooked ever since. I try to play as much as I can whether it’s in professional doubles tournaments, a practice match at the University Club of Boston, or the annual holiday Sobhy family doubles with my sister, brother and father. Whenever I tell people that I play doubles, I constantly get asked the same question, “But doesn’t it mess up your singles?” My answer? No, it doesn’t. In fact, I find that it actually helps my singles game (cue gasps from reader). Let me break it down for you. In doubles, you are playing on a court three times the size of a singles court, with a ball that travels much faster, and you are told to hit all the strokes you would never even think of hitting when playing singles. In singles, it’s mostly straightforward: drive, cross-court, boast, drop and lob. Nobody is expecting an unconventional shot such as a shot down the middle of the court, a reverse corner or a skid boast from the back of the court—all common shots in doubles. I’m not saying that you should regularly use these shots in your singles game, but it gets the mind thinking of different angles that may throw off your opponent. Part of the reason why I love squash so much is that it is such a thinking game. There are so many angles involved, so I try to take some of the non-traditional angles and shots that I use in doubles and implement them into my singles game. If used appropriately, it can be quite effective. When I’m on a singles court, I no longer think only like a singles player, but I try to incorporate my doubles thinking as well. Now let’s move on to court coverage. Every time I get on a singles court after having just played doubles, the court seems so small. I feel like I can get every ball (side note: I really can’t retrieve every ball, but it’s nice to think that I can). Moreover, I am able to see the ball a lot faster because a singles ball moves slower than a doubles ball, and I don’t have to take six or seven steps to retrieve a ball in the front of the court. I only have to take two or three. Ironically enough, my first two competitive tournaments back from my ruptured Achilles injury were professional doubles tournaments. I competed in the Briggs Cup nine months post rupture and then the Boston Open a few weeks later. It was a great segue back into a competitive environment. I was forced to run again, but without the aggressive amount of cutting and changing directions required in singles. I had to react and see a fast-moving squash ball and learn to attack and volley the ball again. 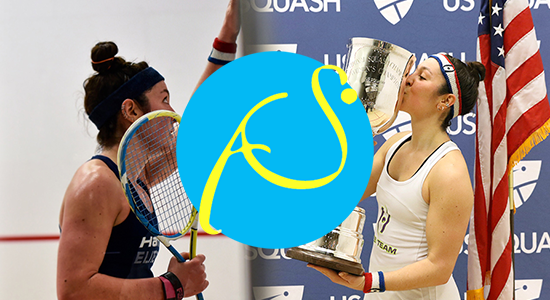 The best part about transitioning into the professional squash world again with doubles is that whenever I got tired (which happened often as I was starting back), I could always rely on my partner to cover the court for me. It pays off to choose a partner who can run! Playing those doubles matches helped me tremendously to prepare for my PSA singles debut at the 2018 J.P. Morgan Tournament of Champions. With every competitive doubles match I played, I slowly got my confidence back. Thanks to the fast paced and hard-hitting nature of doubles, I was reading the ball a bit better and moving to the front of the court a little faster. Now I know my movement was not the fastest or most explosive at the Tournament of Champions, but imagine if that had been my actual first competitive match back? I would’ve been so bad. At the end of the day, whether you are a singles player or a doubles player, we are all playing squash. There’s no rule that you have to stick to either singles or doubles. Why not play both? It’s only going to give you more tools to add to your tool box and help you become in the end a better squash player.